The launching event of the project “Generating evidence on gender sensitive Climate-Smart Agriculture to inform policy in Central America” funded by IDRC and led by CCAFS and CIAT was carried out as part of a broader knowledge exchange event between Central American countries and Colombia. Climate-smart agriculture (CSA) was the main topic of the knowledge exchange which also included discussions on gender implications in implementing and scaling CSA options across the region. The program of the complete knowledge exchange is available in Annex I of this document. Martinez-Baron D. 2018. 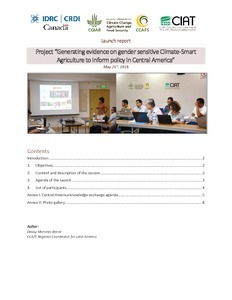 Launch Report: Project “Generating evidence on gender sensitive Climate-Smart Agriculture to inform policy in Central America”. CGIAR Research Program on Climate Change, Agriculture and Food Security (CCAFS).